The Harmonacci Indicator has been crafted for educated traders who are looking for a top-notch indicator which pays attention to fibonacci ratios. 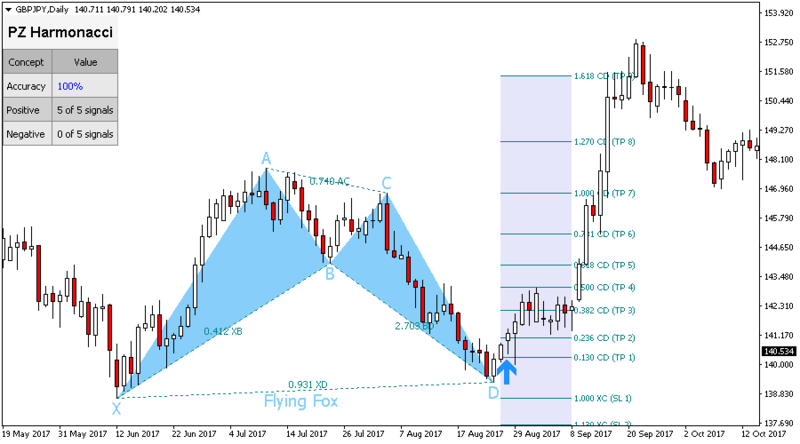 This indicator will be most effective in the hands of traders who are well versed about fibonacci patterns, because patterns can expand and repaint frequently in the forex market. 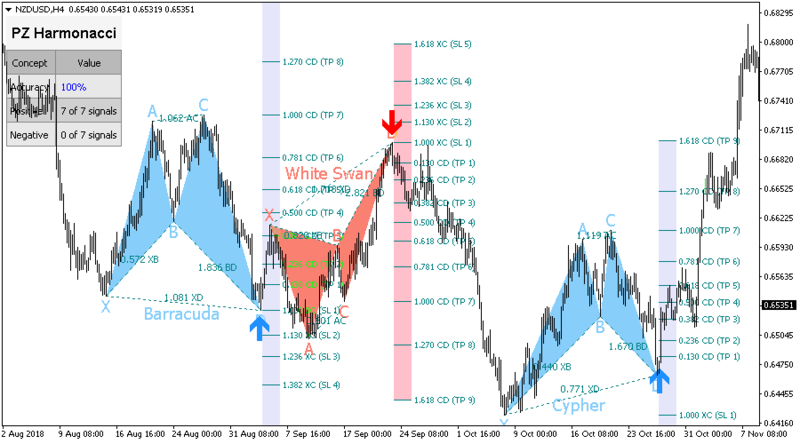 The Harmonacci Patterns indicator is probably the most complete fibonacci patterns auto-recognition indicator you can find for the Metatrader Platform. It detects 19 different patterns and takes fibonacci projections as seriously as you. 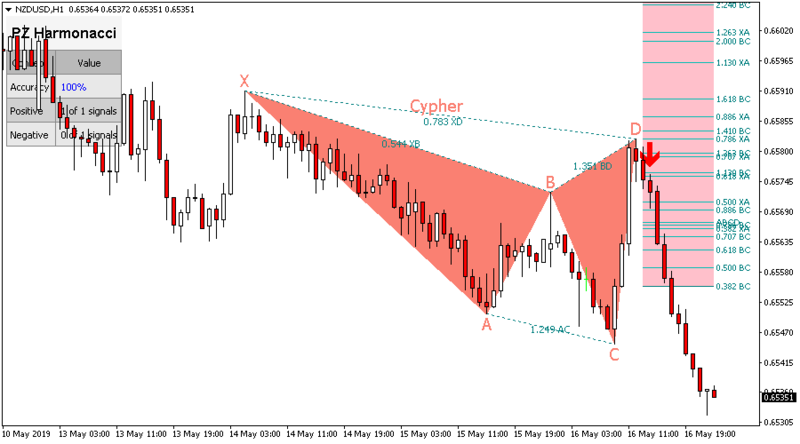 Inspired by Mr. Scott M. Carney's book -Harmonic Trading Vol. 1-, this indicator has been designed to fulfill the needs of the most purist and exigent traders. However, it implements a twist to make it easier to trade: it waits for a donchian breakout in the right direction before signaling the trade, making its signals very reliable. Important: Some patterns have been renamed to self-explanatory alternatives to comply with a trademark complaint from Mr. Scott M. Carney. The logic and ratios of these patterns are exactly the same as those in the original book. The harmonacci methodology utilizes the recognition of specific price patterns and the alignment of exact Fibonacci ratios to determine highly probable reversal points in the financial markets. This methodology assumes that trading patterns or cycles, like many patterns and cycles in life, repeat themselves. The key is to identify these patterns, and to enter or to exit a position based upon a high degree of probability that the same historic price action will occur. Although these patterns are not 100% accurate, these situations have been historically proven. If these set-ups are identified correctly, it is possible to identify significant opportunities with a very limited risk. The concept of the Potential Reversal Zone (PRZ) was originally outlined by Scott M. Carney in his book, Harmonic Trading Vol 1. A wholeheartedly recommended reading. History has proven that a convergence of Fibonacci numbers and price patterns provides a highly probable area for a reversal. This area of convergence is called the potential reversal zone. When three, four, or even five numbers come together within a specific area, you must respect the high probability for some type of reversal. A Potential Reversal Zone (PRZ) represents the critical areas where the flow of buying and selling is potentially changing. These fibonacci price zones attempt to identify the price levels where imbalanced overbought and oversold situations are reversing back to their respective equilibrium level. An ideal reversal usually tests all of the price levels in the Potential Reversal Zone (PRZ) on the initial test. The predominant trend usually reverses from this initial test of the entire PRZ and continues in the reversal direction shortly thereafter. In an ideal reversal, the price bar that tests all of the fibonacci projections in the PRZ is called the Terminal Price Bar. The trade must be taken when the Potential Reversal Zone (PRZ) has been tested and rejected by a Terminal Price Bar or a strong breakout has taken place in the reversal direction without testing all the PRZ levels. 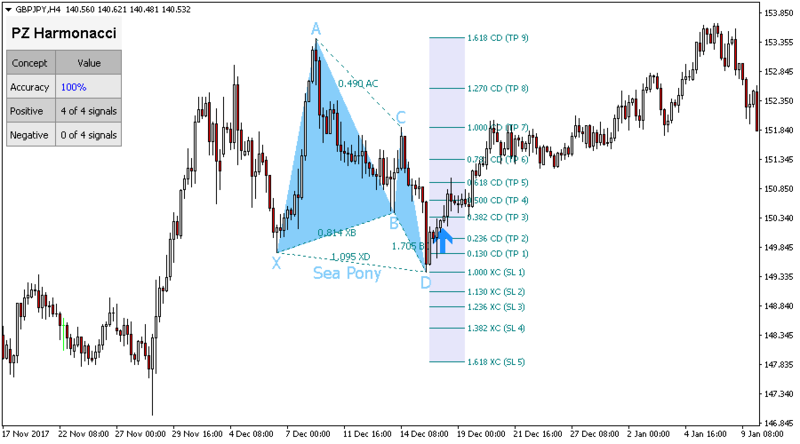 The farthest price level of the PRZ or the Point X of the pattern are suitable stop-loss levels. The indicator calculates all the important fibonacci ratios for the XA and BC vectors of the pattern, and plots them by the Point D if applicable. Directly derived from the Fibonnaci Number Sequence. Once a pattern is detected, the following steps have to be taken, which can lead to take or discard the trade. Bear in mind that a pattern is not valid by itself and it can expand as long as it likes. Your job has an trader is to assess the validity of the pattern and the potential reversal zone before entering the market. 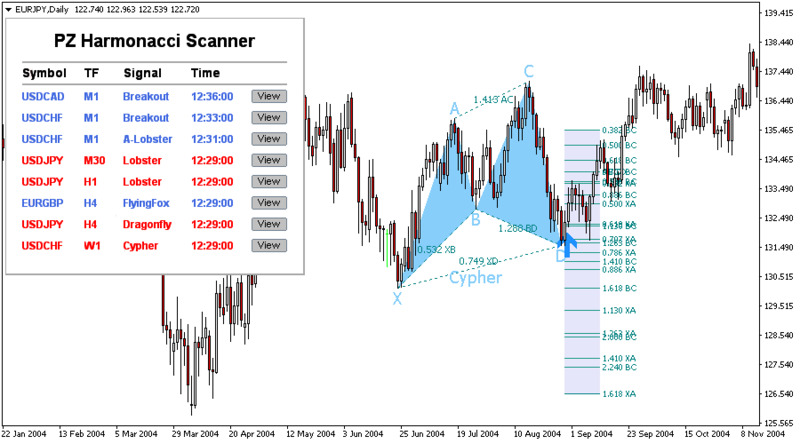 This indicator auto-detects and alerts harmonacci patterns. Evaluate the fibonacci projections plotted on the chart by the indicator and look for strength signs. Can you find at least three converging projections? Do you see primary ratios? Is the ABCD projection present? The PRZ can be tested and rejected by one single Terminal Price Bar, or the market can reverse and breakout the PRZ without testing all the fibonacci projections. In any case, the market has to move before you take the trade. You are a follower, not a predictor. Trade the breakout or the rejection of the PRZ and set the proper stop-loss. The farthest price level of the PRZ or the Point X of the pattern are suitable stop-loss levels. It is recommended to reap partial profits as soon as possible to lock into a free ride. Scott M. Carney proposes a very interesting position management system based on a 0.382 Trailing Stop, measured from the reversal point to the reversal extreme. 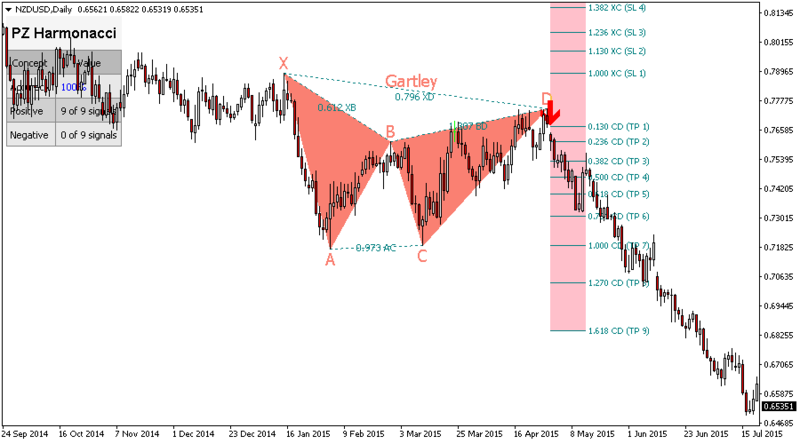 The Potential Reversal Zone (PRZ) is a crucial element in the trading process. Hence the importance of vector-independent primary, derived and complementary fibonacci projections, which all other indicators ignore completely. This parameter controls the size of the patterns to be found, expressed as minimum amount of bars between alternative points. A higher number will cause bigger patterns to be found. A donchian breakout is needed for a signal to arise after a pattern is found, and this indicator controls the amount of bars used in aforementioned breakout. Amount of history bars to evaluate when the indicator loads. Pattern detection can be tight or loose. To increase the amount of patterns found, increase the deviation. To find only perfect patterns, decrease the deviation. Enable or disable performance screen stats. Choose what patterns to scan for: disable all those you don't use. 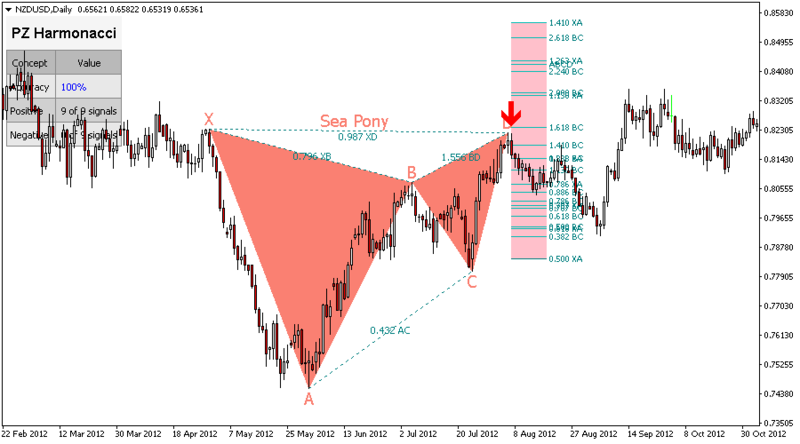 Configure the colors of bullish and bearish patterns, as well as font sizes. Enable or disable ratios and choose your own ratio colors. Enable or disable breakouts, and set your desired arrow sizes and colors. Enable display/email/push/sound alerts for patterns. Hey! I know all these patterns with different names! We are aware. Sadly, the writer of the book owns trademarks with all the pattern names and we are legally forbidden from using any of them. We've replaced the pattern names with obvious and self-explanatory alternatives. Yes, it does. The last point of the wave can expand as long as it likes, therefore the indicator must repaint. 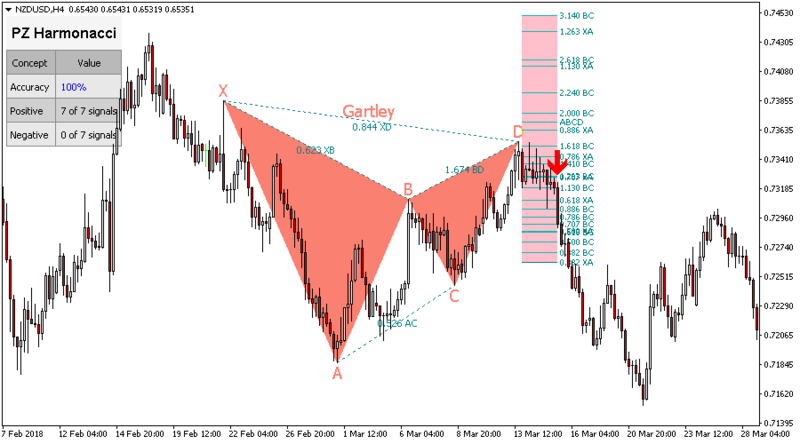 It is your job as an harmonic trader to assess the validity of the Potential Reversal Zone (PRZ) and wait until it has been rejected to take the trade properly. To make things easier, the indicator implements a trading signal based on price breakouts, which is evaluated after a pattern is formed. This helps timing the trade because most patterns do not expand any more after a meaningful breakout has happened in the opposite direction. They do, because the indicator displays the actual ratios of the pattern. As long as the ratios of the pattern are inside the pattern definition -with a little wiggle room which you define in the indicator inputs-, the pattern willl be drawn. When is a pattern displayed? A pattern is displayed when the D point exists and all ratios of the pattern are valid.